How do you pick just 50 great games from among the thousands played by the most successful franchise in pro sports? It's not easy, but Tan does a fine job choosing the most important contests from 100 seasons of Yankee baseball and recounting them in a gripping style. 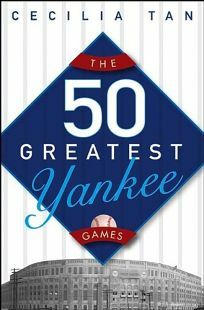 From Babe Ruth's ""called shot,"" to Bucky Dent's devastating 1978 playoff homerun, to Aaron Boone's clinching blow in the 2003 American League Championship Series, most of the biggest events in Yankee history are brought to life in this book. One can argue with some of Tan's choices-and Yankee fans inevitably will-but that's half the fun. Tan, an experienced baseball writer and devoted Yankee fan, draws on research, contemporary press accounts and interviews she conducted with players such as Yogi Berra, Dwight Gooden, Reggie Jackson, Bobby Murcer and Whitey Ford to recreate the games and illuminate key moments. Tan displays a knack for narrative, developing entertaining, dramatic story lines even though the outcome is never a surprise. If you saw one of the games (or watched it on television), long-forgotten details will come flooding back. If you didn't see the game, you'll almost feel as if you were there. Yankee fans should enjoy this celebration of their favorite team.